1. Shall I go to the race this time? To start with, I only bought my race ticket on Wednesday! I knew I was coming out to Barcelona, but having watched this race live a few times, I was pondering whether to just watch from a bar in town and come to the track for testing instead (€15 rather than €115). Makes financial sense, but since when did Financial sense and Formula 1 go together?! 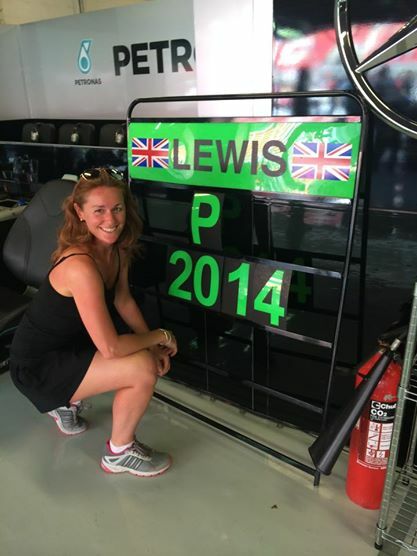 Come on Rebecca, it’s your first race of the season, Mercedes are owning the championship, the boy’s on flying form, and to watch him win would be just awesome. So I decide to get a race day ticket. 2. Shall I sit in the grandstand this time? 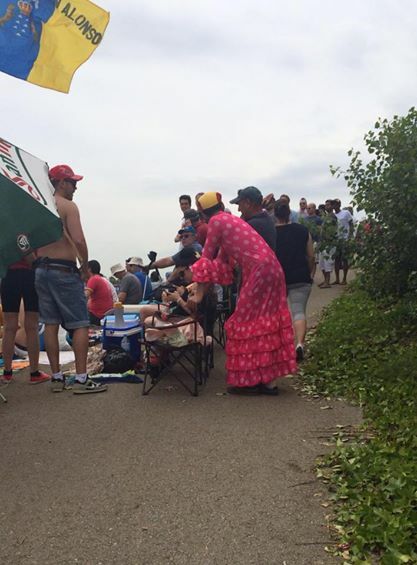 I nearly always buy a General Admission 3-day pass, which gets me into the circuit, leaving me to wander round, find a spot with my blanket and settle in for the day, enjoying the action on the track as much as the banter and people watching around me. However, because I’ve left it so late, there are only a few grandstand tickets left, and they’re trying to get rid of them by selling them off cheap. So for €180 I can get a seat! Being a tight northern lass, I decide that I could spend the extra few Euros on something I haven’t done before, so opt to stick with general admission. Having booked so much F1 already this year, I have very little annual leave left, so I opt for the early flight Saturday morning. This is fine – I can just get an early night on Friday and get up early Saturday morning right? Well any normal person would, yes. But what do I do? I go to a ball at Kensington Roof Gardens Friday night, consume silly amounts of champagne, get two hours’ sleep, and drag myself out of bed for my cab at 5:15am. And I did well until 5:20am, when I texted my taxi to see if he was on his way, only to receive a reply 5 minutes later saying “No, didn’t know I was meant to be picking you up…?” Right. Plan B then! Can I get the tube? Not enough time. Can I book another cab? Can’t get me a car for another 25 minutes. Hailo it is then. And £65 later (there goes my General Admission savings) I arrive at T5 at 6:01am – breath Rebecca! 4. Shall I sit and stay or walk the track? I brought my running kit to Spain this year, hoping to run the circuit during testing (when the fans, paps and associated security have all gone). With no sign of sun this morning, and an emerging blister from yesterday’s flip flops, I opted to go for the comfort look today, and wore my running shorts and trainers (with a Mercedes AMG Petronas top, of course). So by the time we reach lap 61/66, and I’ve reached the last turn on the track, I suddenly realise I’m in with a chance of running faster down the finish straight than most people around me, meaning I could even get under the podium for the champagne! Challenge! So after jumping up and down squealing as Nico closes the gap on Lewis each lap towards the end, I am so excited to see Lewis take the chequered flag, that my adrenalin is pumping and I’m poised for a faster start than Valteri Bottas! Having eaten his sweets and enjoyed the anthems and champagne, I contemplate whether to head back to the merchandising area and buy myself a souvenir programme of the day. The merchandising area will be quiet now, so could be a good time. But I’m enjoying hanging over the pitwall, watching Suzy, DC and Eddie wander up and down, and Ted Kravitz filling up his infamous Notebook. So I decide to stay and watch a bit longer. After a few minutes, Mr P pops back over to say hello and the look on my face turns to disbelief… I know what that is in his hand! 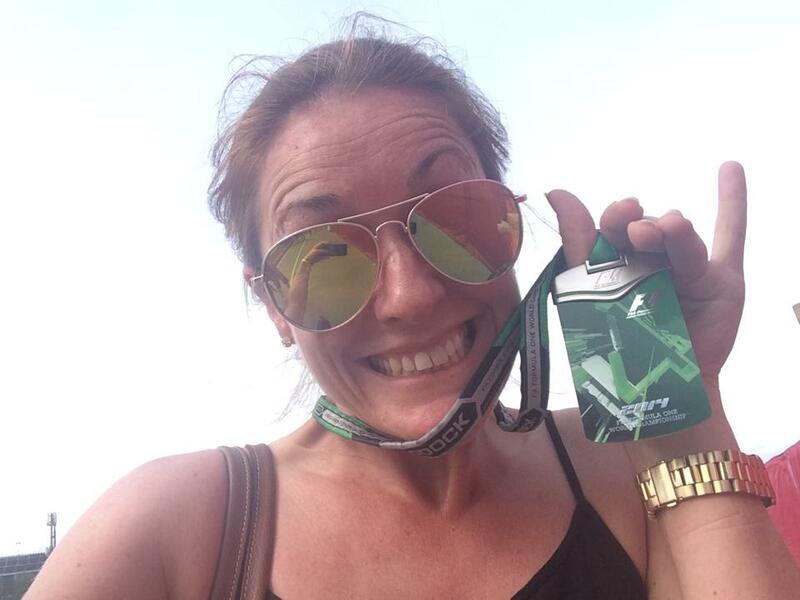 It’s a green (VIP paddock) pass!!! His red (pit lane) pass is still round his next, so it can’t be for him!!! Oh… My… God…!!! I’m handed the pass and told to ‘pelt it back to the turnstiles…’ and that’s it, I’m off again! I run as fast as I can back up the track to the gate, round the grandstand, and down to the media tunnel, still not quite able to believe that I have a pit pass! When I meet Mr P in the media tunnel, he tells me ‘Lewis is still in the garage, if we’re quick you might catch him…’ Oh sweet Jesus, I run faster than ever, taking the stairs three at a time, and buzz my pass through the turnstiles. We dive through the FIA garage and down the pitlane, overtaking Pinky and the Sky Sports F1 cameras, and into the Mercedes garage, just as Lewis is walking towards us! Mr P says ‘get your camera, I’ll introduce you…’ By this point, I’ve no idea what I’m doing, I can’t find my phone in my bag and Lewis has stopped right in front of me. I am introduced, I ignore looking for my phone, and shake hands. 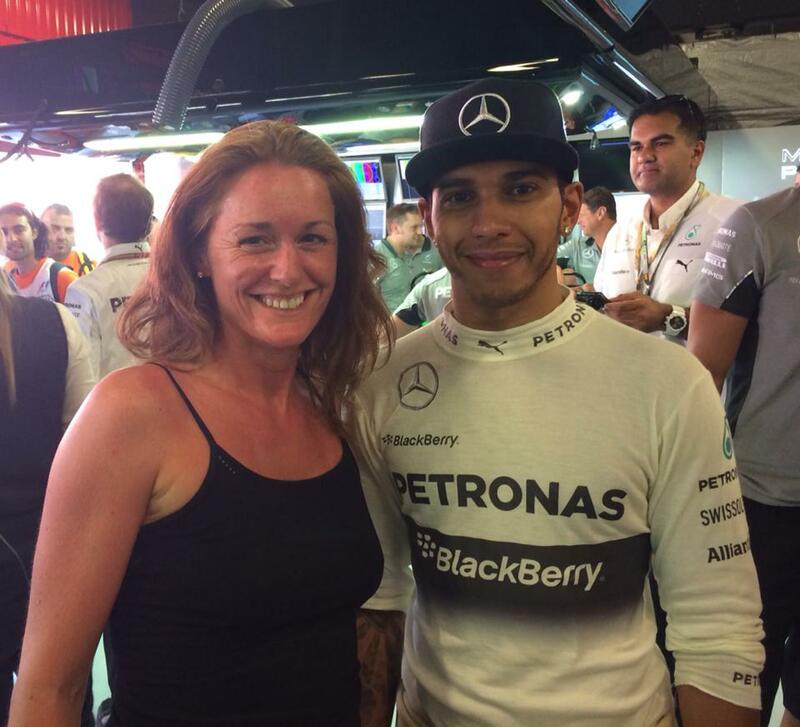 All I can think of is don’t mention watermellons… so I constructively come up with ‘Great to meet you Lewis! Awesome drive today, congratulations!’ Not a watermelon in sight Rebecca, well done. Camera? Damn! Where’s my phone?! I fumble for it for a few seconds and he waits, he flipping waits for me! Unfortunately, I can’t find it, so I tell Mr P to tell him to keep going. Just as I find my phone! We cut back to the back of the garage and as he approaches the door, Mr P asks him if we can get a photo? ‘Sure, man…’ Eeeeeeeeeeeek! I get two photos with Lewis Hamilton! It all went so quickly, that I didn’t have time to prepare or to get excited. I could’ve not bothered to go to the track on race day, but I got a ticket. I could’ve taken a grandstand seat, but I chose to be trackside. I could’ve worn flip flops like usual, but I opted for trainers. I could’ve left the pitwall after the podium, but I hung around. Even when I got the paddock pass, I didn’t know he’d be in the garage. Even when I got in the garage, I didn’t know I’d get close enough to really see him. And even when I couldn’t find my phone, I thought I’d missed the chance as I’d already been introduced to him. But I did. When I bought tickets for the Canadian Grand Prix a few months ago, I was told they’d be delivered by UPS a couple of weeks before the event. So after some initial squeals of excitement, the novelty soon died down until I received emails from both UPS and Gootickets this week, suggesting ‘my delivery had been despatched’. At this point I naturally reverted to a mental age of five and became fidgety at my desk, much to the amusement of those around me. That was, until Alix pointed out that I probably wouldn’t be here when said delivery was delivered, as I’d be gallivanting around the Catalonian countryside chasing racing cars. She also kindly pointed out that, if said delivery (unlike the despatch notice) actually bore any markings which gave away its contents, said delivery would most likely be delivered, coveted, and auctioned-off to the highest bidder before my return. At this point, I recruited the help of the someone else who has shown a tendency of getting excited when the post team approach her desk with packages. Michelle sits beside me at work, and last week was heard to mutter ‘I do love a delivery’. (She could, of course, have been referring to her ASOS parcel at the time, but hey). I then forwarded to Michelle all email correspondence I’ve had with Gootickets, UPS and the organisers of the Canadian GP, giving her full responsibility to sign for my delivery on arrival, and strict instructions to protect its contents with her life. Needless to say, such empowerment left Michelle totes emosh and the prospect of the UPS man walking up to her desk again suddenly became amaze balls. AN: my lack of understanding of descriptions such as ‘totes emosh’ and ‘amaze balls’ caused further entertainment, and any potential misuse of such language should be excused entirely. My tickets now scheduled to have more security that Lewis Hamilton’s dog Roscoe, I happily went off to my Friday morning meetings. As I returned to my desk, a strange air of silence (typically unusual of our office) was noticeable, only to be broken by Alix asking whether my morning had, so far, gone well. Slightly bemused, I answered cautiously with not bad (token non-committal answer), from where Alix continued her coy interrogation of my state of mind, asking whether it could possible get any better in any way. Still bemused, I answered again, cautiously, that it could, possibly, I suppose? At this point, she produced a UPS package and, you guessed it; my five-year-old self returned, the typically unusual silence was broken, and the more normal excitement that is working in Wealth Management resumed. In other words, Rebecca got all excited about F1, Scott tutted a bit, Janice opened a can of Dr Pepper, Michelle got totes emosh, we can’t talk about what Alix was doing and Mark was nowhere to be seen (probably grabbing coffee). So excited, I think I’ll go to Barcelona and watch a Grand Prix!